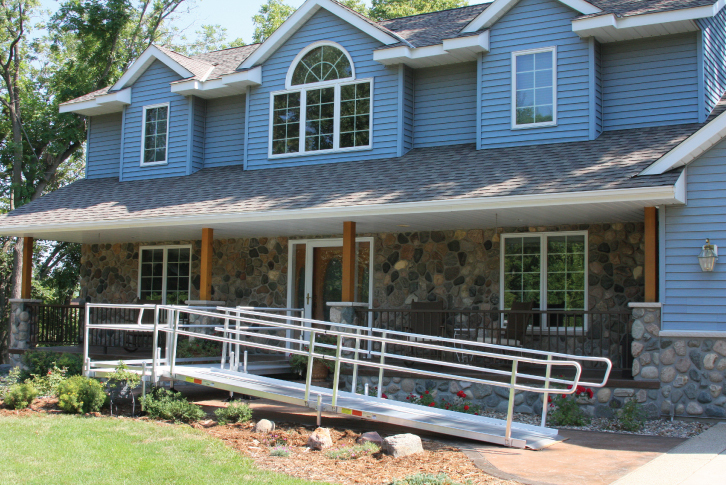 Ramps for home accessibility are installed in a variety of configurations by our Home Accessibility contractor. Aluminum, steel, and wood ramps can be purchased. Aluminum ramps can also be rented. Aluminum ramps to allow home accessibility can either be rented or purchased. They come with a lifetime warranty and install in hours. There is no rotting, rusting or splinters. A multi-weld fabrication process add strength and ensures less deflection of ramp surface. The unique welded cone-mounted handrail design is more rigid than standard side-bolted handrails and is the only open mesh aluminum accessibility ramp on the market. Steel ramps for home accessibility come with a 3-year warranty and are available for purchase. They installs in hours and feature a textured finish for slip resistance. A tuxedo black color complements any exterior finish, and a modular design allows virtually any configuration. Wood ramps allow home accessibility and have a one-year warranty. They are available for purchase. They can be painted or stained to match existing deck or porches and are pressure treated to prevent rotting. Their unique leg design maximizes structural integrity and they have vertical pickets and steps available. The spacing of the wood decking allows for drainage. It is ADA compliant at 36″ wide. Portable ramps that fold up can be placed in a vehicle for a convenient and easy way to have full accessibility at home or a relative or friend’s house. Users take out two hinge pins and can easily separate the foldable ramp into lightweight sections. They have a slip resistant surface and self-adjusting bottom transition plates which independently adjust to the ground surface. Accessibility ramps are a private pay item and cannot be covered by insurance.